FLOWER MOUND, Texas, Oct. 16, 2017 — ProTom International Holding Corporation announces that it has signed a contract for the purchase and installation of a proton therapy system at the Boao Evergrande International Hospital in China’s Hainan Province. ProTom will equip the hospital with its Radiance 330® Proton Therapy System three-room configuration, including two gantry-rooms and one fixed-beam room. Using FidelityTM Beam Scanning, Radiance 330 delivers vanguard proton therapy treatment with the precision of pencil-beam scanning and the power of integrated imaging. Radiance 330’s compact and modular design has the smallest synchrotron footprint on the market, making it fully adaptable and customizable. The novel design of Radiance 330’s synchrotron also enables the system to produce fewer neutrons, and to run more efficiently, generating less heat and electricity than other proton beam therapy systems. With low capital and operating costs, Radiance 330 delivers the industry’s fastest return on investment. Boao Evergrande International Hospital, scheduled to open in 2018, is located within the Hainan Boao Lecheng International Medical Tourism Pilot Zone. The hospital will focus on cancer treatment and prevention and will leverage the zone’s unique policies to bring advanced tumor treatment therapy, equipment, technology, and talent to China. It is anticipated that more than 2,000 patients each year will be treated with cutting-edge proton therapy treatment at Boao Evergrande International Hospital’s proton therapy center. 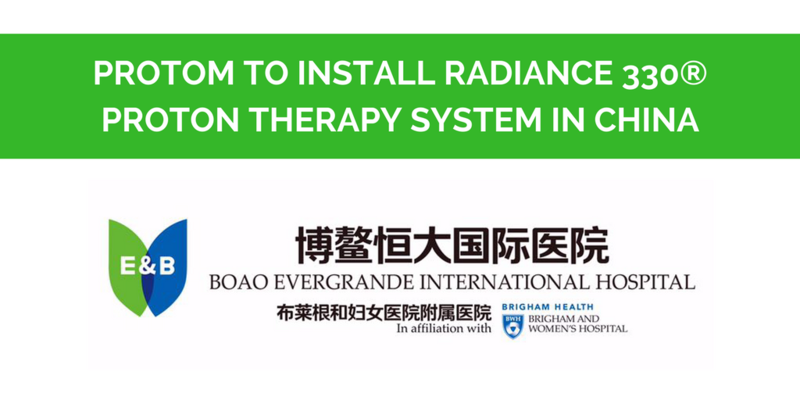 “With the installation of our Radiance 330 system in China’s new oncology hospital, we are excited to expand the availability of proton therapy treatment to patients in China, and to those traveling to Hainan for cancer treatment,” said Stephen Spotts, CEO of ProTom International Holding Corporation. ProTom International Holding Company is a leading device manufacturer of proton therapy technology. ProTom is steadfast in its mission to transform cancer treatment by expanding the accessibility of proton therapy and by developing proton tomography technology. Hainan Boao Evergrande International Hospital LTD is a 100% subsidiary company of Evergrande Health Group.